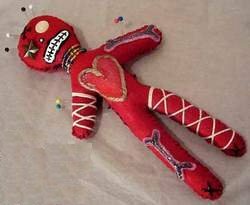 Voodoo dolls are a well-known magickal tool, though we tend to see them more in pop culture areas like TV shows and movies, so you may not have a really accurate idea of their nature. We've all seen shows that have little Voodoo dolls in them, where someone stabs them with a pin and then the person who the doll is made for jumps in pain. Needless to say, that doesn't really happen. But the use of Voodoo dolls in spells and rituals is legitimate, and there are many applications where it makes sense to take this approach. In more traditional witchcraft, they are called poppets. The function is that the doll represents a certain person and helps you direct your energy and intentions to them specifically. While you can stick pins in a doll or poppet if you want, that's not really the usual way of using them. A doll can be sculpted out of clay or wax, or sewn from fabric. You don't have to be a master artist, but try to make it resemble the person in question (hair and eye color, for example). Add something of theirs if you can. The doll then becomes the focus on your spell. Herbs can be used in the stuffing for added energy, and you can choose the material colors to suit your purpose. Though the idea of using a doll does tend to be more of a Voodoo idea, you can also utilize the concept in any spellwork you are doing. Leave the Voodoo Dolls page and go back to the main Voodoo Spells page.